The articular capsule surrounds the joints, and is attached, above, to the borders of the articular surfaces of the tibia and malleoli; and below, to the talus around its upper articular surface. The joint capsule anteriorly is a broad, thin, fibrous layer, posteriorly the fibres are thin and run mainly transversely blending with the transverse ligament and laterally the capsule is thickened, and attaches to the hollow on the medial surface of the lateral malleolus. The synovial membrane extends superiorly between Tibia & Fibula as far as the Interosseous Tibiofibular Ligament. Flat Weak Band that extends Anteriomedially. 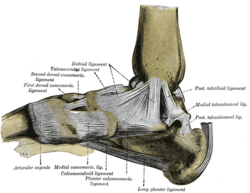 Most commonly damaged ligament of the ankle. Restrain anterior displacement of the talus in respect to the fibula and tibia. Thick, fairly strong band that runs horizontally medially. This ligament is under greater strain in full dorsiflexion of ankle. Rarely injured because bony stability protects ligaments when ankle in dorsiflexion. Forms the back wall of the recipient socket for the talus' trochlea. Resists posterior displacement of the talus. Aids Talofibular stability during Dorsiflexion. Restrain inversion of the calcaneus with respect to the fibula. Prevent Talar tilt into Inversion. The reported normal available range for dorsiflexion varies in the literature between 0-16.5o and 0-25o. This changes in weight bearing. 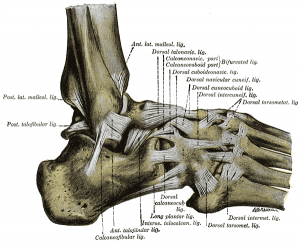 Anatomy of the Ankle Ligaments: A Pictorial Essay - In this pictorial essay, the ligaments around the ankle are grouped, depending on their anatomic orientation, and each of the ankle ligaments is discussed in detail. ↑ 4.0 4.1 4.2 Moore KL, Agur AMR, Dalley AF. Essential Clinial Anatomy. Baltimore: Lippincott Williams and Wilkins, 2011. ↑ Baggett BD, Young G. Ankle joint dorsiflexion. Establishment of a normal range. Journal of the American Podiatric Medical Association. 1993 May;83(5):251-4.